Dishing it up! : Dine Originals Restaurant Week! Okay, this post might be a little late in the week but you still have a couple of days to enjoy. Enjoy what you ask? Why Columbus's Restaurant Week from the Dine Originals Columbus group! Formed to promote local restaurants, with over 40 members this is the week to try as many out as you can. Every restaurant is offering a set menu, some for $15, some for $30 as way to get more people exposed to the local dining scene. 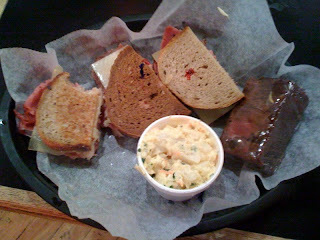 Tonight my hunny and I went to Katzinger's for their "Flight of Corned beef sandwiches. For $7.50 per person or $15 for two people you get a half of three different sandwiches, a small side of potato salad, a half brownie and of course PICKLES! Drinks are extra, but two people can still get it all for under $20. Let me tell you, this was a TON of food for the money! And delicious! The flight included a half of their reuben, Gene's Free Lunch and Jeff's Super Soaring Sandwich. There is an option for three turkey sandwiches or two small veggie sandwiches for those who are so inclined. Available all day for dine in or take out, this is definitely one trip you want to make this week! Sure looks good. That was one I had really wanted to get to. Love Katzingers!! !